FDSB Registered. 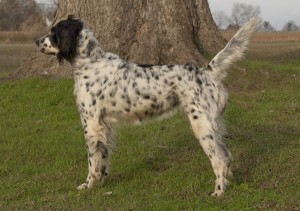 Southern Serenade, nicknamed Jenny, is a beautiful tricolor female English Setter. She weighs approximately 45lbs. She is directly from Lloyd Murry’s Long Gone Kennels in New Hampshire and has many of the classic foundation setter lines in her pedigree. Southern Serenade’s Pedigree — Click on the link below and then click again to see the pdf file.